The outage probability of reverse link multicarrier (MC) code-division multiple access (CDMA) systems with beamforming in the presence of carrier frequency offset (CFO) is studied. A conventional uniform linear array (ULA) beamformer is utilized. An independent Nakagami fading channel is assumed for each subcarrier of all users. The outage probability is first investigated under a scenario where perfect beamforming is assumed. A closed form expression of the outage probability is derived. The impact of different types of beamforming impairments on the outage probability is then evaluated, including direction-of-arrival (DOA) estimation errors, angle spreads, and mutual couplings. Numerical results show that the outage probability improves significantly as the number of antenna elements increases. The effect of CFO on the outage probability is reduced significantly when the beamforming technique is employed. Also, it is seen that small beamforming impairments (DOA estimation errors and angle spreads) only affect the outage probability very slightly, and the mutual coupling between adjacent antenna elements does not affect the outage probability noticeably. Future wireless communication systems demand high-datarate multimedia transmissions in diverse mobile environments. The underlying wideband nature makes the overall system vulnerable to the hostile frequency-selective multipath fading. Code-division multiple access (CDMA) has received tremendous attentions because it offers various attractive features such as high spectrum efficiency, narrow-band interference rejection, and soft capacity [1, 2]. Recently, the multicarrier (MC) CDMA system, which is a combination of orthogonal frequency division multiplexing (OFDM) and CDMA, has gained significant interests as a powerful candidate for future wireless broadband communications . Multicarrier CDMA inherits distinct advantages from both OFDM and CDMA. By dividing the full available bandwidth into a large number of small orthogonal narrow bands or subcarriers each having bandwidth much less than the channel coherent bandwidth, the transmission over each subcarrier will experience frequency nonselective fading. Also, it can be interpreted as CDMA with spreading taking place in the frequency domain rather than temporal domain, achieving enhanced frequency diversity. MC-CDMA is basically a multicarrier transmission scheme and its receiver is vulnerable to carrier frequency offset (CFO) which is due to the mismatch in frequencies between the local oscillators in the transmitter and the receiver. Antenna array techniques are used to reduce interference to meet increased capacity requirements without sacrificing the frequency spectrum [4, 5], which can be realized through space diversity, beamforming, and spatial multiplexing . In this paper, the use of conventional uniform linear array (ULA) beamformer  is to provide performance improvements in MC-CDMA systems, especially with the consideration of CFO. The outage probability is an important performance measure in the design of wireless communication systems, which represents the probability of unsatisfactory reception over an intended coverage area. The performance in terms of the bit error rate (BER) for MC-CDMA systems has been investigated in a number of literatures, either assuming perfect carrier frequency synchronization [8, 9], or with CFO [10–13]. There have been several papers studying the outage probability performance in various CDMA systems [14, 15, 18]. However, MC-CDMA systems have not been examined in such studies. In this paper, the reverse link of an MC-CDMA system with the beamforming technique in the presence of CFO is considered, and we concentrate the analysis on the outage probability performance. A Nakagami fading channel is assumed throughout the paper. Based on a newly developed simplified beamforming model , a closed-form expression is derived for the outage probability when perfect beamforming is considered. The impact of CFO and beamforming is modeled in signal and interference expressions. 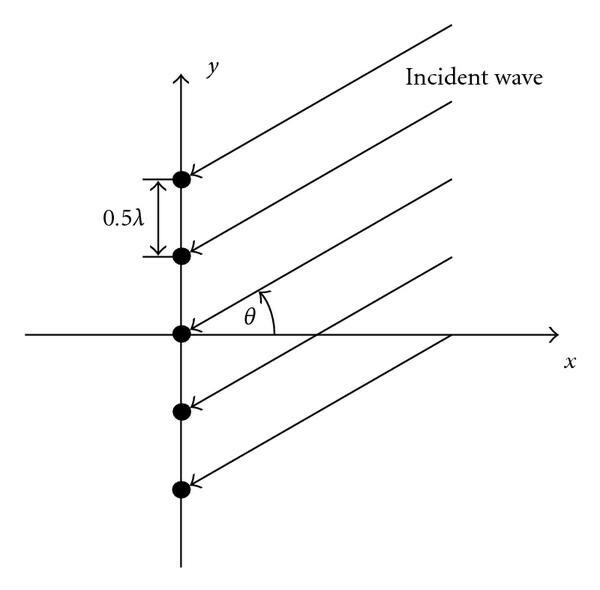 Furthermore, the effect of various beamforming impairments is examined, including direction-of-arrival (DOA) estimation errors, angle spreads, and mutual couplings. To summarize, this paper differs from previous research mainly in two aspects: first, we develop signal and interference models to characterize the beamforming gain and CFO in MC-CDMA systems; second, outage probabilities are derived for MC-CDMA systems with either perfect or imperfect beamforming in the presence of CFO. The remainder of the paper is organized as follows. The system model is described in Section 2. The outage probability for MC-CDMA with beamforming in the presence of CFO is presented in Section 3. The effect of impairments in beamforming is investigated in Section 4. Numerical results are presented and discussed in Section 5. Conclusions are given in Section 6.
where is the number of antenna elements and is a scan angle. The beam could be steered to a desired direction by varying , that is to say, setting equal to the arrival angle of the desired signal. Hereafter, we will use the antenna pattern specified in (1) to evaluate the outage probability for MC-CDMA systems with beamforming in reverse link transmissions. where and are the first and second moments of the antenna gain, respectively, averaged with respect to uniformly distributed random variables (RVs) and from to . We have to point out that throughout the paper the desired user still uses the exact beam pattern as illustrated in Figure 2(a), nevertheless, multiuser interferers will use the above simplified beam pattern with parameters and as shown in Figure 2(b) in performance evaluations. where is the channel fading gain on the th subcarrier of the th user and is assumed to be independent for different and , is the Nakagami- fading parameter which ranges from to , , and is a gamma function. where and are the transmit and receive beamforming gain, respectively; and are the transmit angle and arrival angle from the th user to the BS, respectively; is the estimated arrival angle that is used to steer the beam to the desired th user and is assumed to be equal to , that is, sinc = and is the normalized CFO (NCFO) for the desired th user, and assume that ; denote as the NCFO for the th interfering user which is uniformly distributed over . 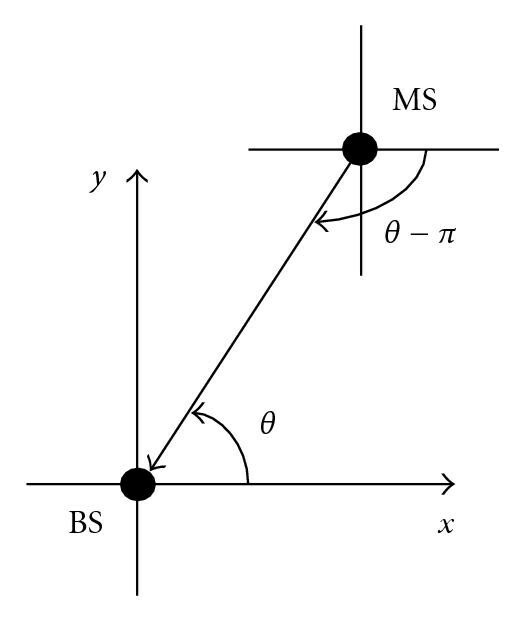 Figure 3 indicates angle notations in transmit beamforming at the MS and receive beamforming at the BS. Angle notations for transmit beamforming and receive beamforming. where is the power spectral density (PSD) of the additive white Gaussian noise (AWGN). Due to the complexity of the actual beamforming pattern, a closed-form expression to evaluate the average outage probability in (22) could not be derived. While, a numerical approach can be used to evaluate (22), the computation complexity of calculating above multi-dimensional integration is significant when the number of users presented in the system is large. where and are determined based on the actual beam pattern. In practice, a variety of beamforming impairments, such as DOA estimation errors, spatial spreads, and mutual couplings, exist in the system. However, the outage probability analysis in previous section is just based on perfect beamforming. In this section, we will evaluate the outage probability by considering those beamforming impairments. All impairments will affect the shape of the beam pattern and antenna gain. We need to point out that in the simplified beamforming model, only parameters and need to be modified according to the change of the beam pattern due to impairments. The outage probability can still be obtained through (24) but with revised parameters and accordingly. respectively, where is the expectation with respect to all the RVs , and . and are the mean of RV and , respectively. Substitute (31) into (2) , the modified and can be obtained. The actual beam pattern is used for the desired user, while for the interference users, the simplified beam pattern described in Section 2.2 is used. From Figure 4 to Figure 6, the outage probability is evaluated when perfect beamforming is assumed at the BS. Figure 4 shows the effect of receive beamforming on the outage probability for reverse link MC-CDMA systems when CFO is present. The Nakagami fading parameter is set to 1; SNR is assumed to be 10 dB. 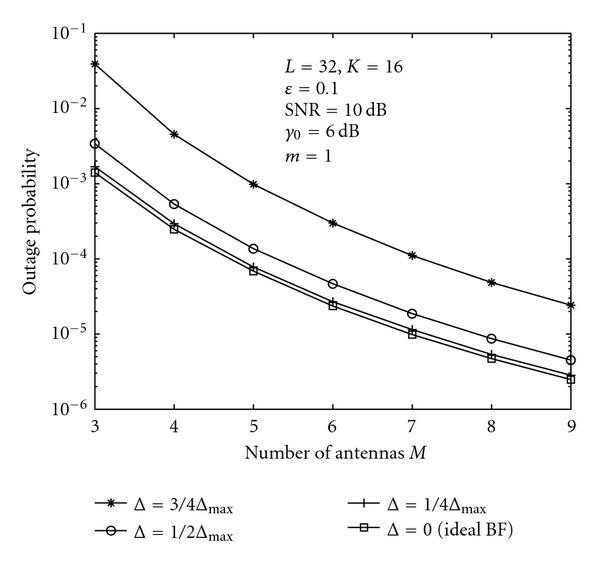 It can be observed from Figure 4 that the outage probability improves significantly as the number of receive antenna elements increases. The beamforming technique has brought a noticeable benefit for the system performance. 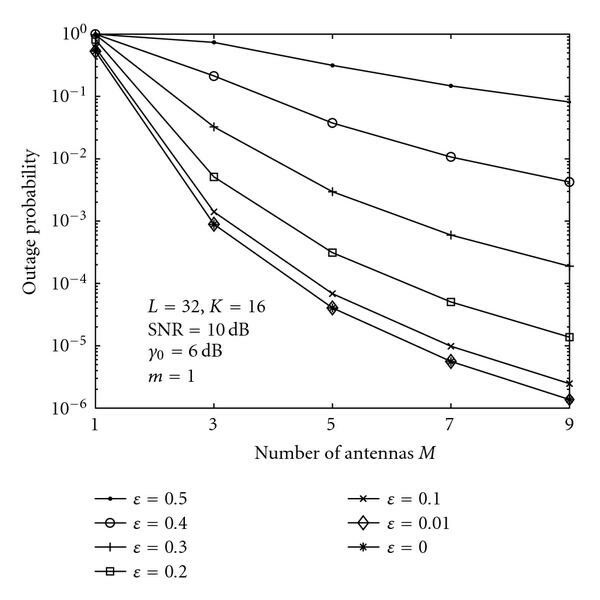 The larger the number of receive antenna elements, the lower the outage probability of the system. It is also seen from Figure 4 that the beamforming plays an important role in mitigating the impact of the CFO. The outage probability is approximately 0.1% when the NCFO and the number of antenna elements . When the CFO increases to 30%, the outage probability deteriorates to 4%, which could be improved to 0.1% through the use of a larger number of antenna elements . This illustrates the significant benefit of using the beamforming technique. Outage probability versus number of antennas M and NFCO . 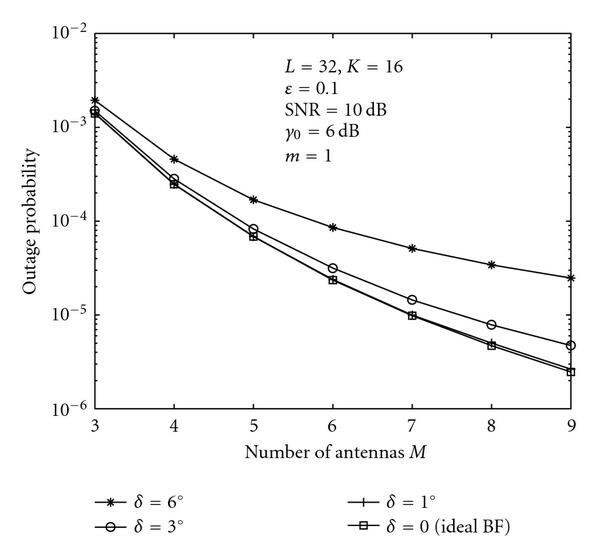 Figure 5 presents the outage probability versus SNR with different number of receive antenna elements. The NCFO and Nakagami fading parameter are set to 0.1 and 1, respectively. We observe that as SNR increases, the outage probability decreases gradually. 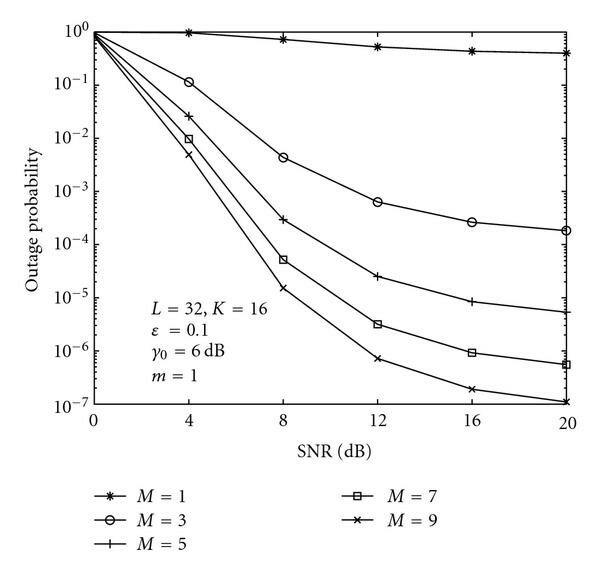 It can be seen from Figure 5 that the outage probability remains at a very high level no matter how much SNR increases when the system does not employ beamforming (the number of receive antennas ). This is due to the fact that the MUI contributes most of the impairments to the system in this situation, and there is no beamforming technique to mitigate the MUI. Hence it is difficult to achieve the required SINR threshold . However, when beamforming is used ( ), it will combat the MUI efficiently; as a result, the outage probability decreases greatly. 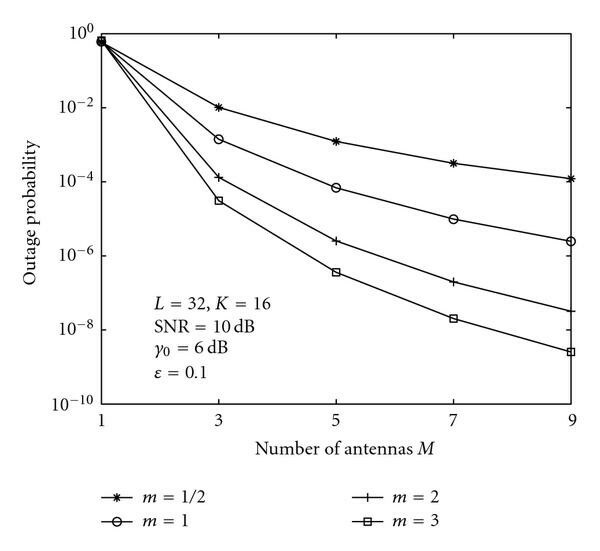 Outage probability versus SNR and number of antennas M .
Outage probability versus number of antennas M and Nakagami m .
Figure 6 gives the outage probability under different Nakagami fading parameter . Again, the SNR is set to 10 dB. The figure shows that the outage probability decreases as the parameter increases. That is because that the better channel environment the system experiences, the larger the parameter . Better channel conditions definitely improve the system performance. From Figure 7 to Figure 9, we investigate the impact of beamforming impairments on the outage probability of the system. Outage probability with DOA estimation errors. is the standard deviation of uniformly distributed DOA estimation errors. M is the number of antennas. In the following, a small CFO is assumed in the system, that is, ; the SNR is set to 10 dB and all users experience Nakagami fading ( ) over each subcarrier. Figure 7 shows the effect of DOA estimation errors. The DOA error is assumed to follow a uniform distribution with a standard deviation , and is given in (27). It can be seen from Figure 7 that the DOA estimation error does not impact much on the outage probability when the error is within the half null-to-null beam width . When a larger DOA estimation error is present, that is, the case of in Figure 7, it leads to a significant increase of the outage probability. Figure 8 plots the outage probability when different angle spreads are present in the system. The angle spread is assumed to follow a uniform distribution with a standard deviation . We observe that the outage probability does not vary much when is small, that is, . However, a noticeable deterioration of the outage probability can be seen if the angle spread is large, that is the case of in Figure 8. Outage probability with angle spreads. is the standard deviation of uniformaly distributed angle spreads. M is the number of antennas. Outage probability with mutual coupling. M is the number of antennas. 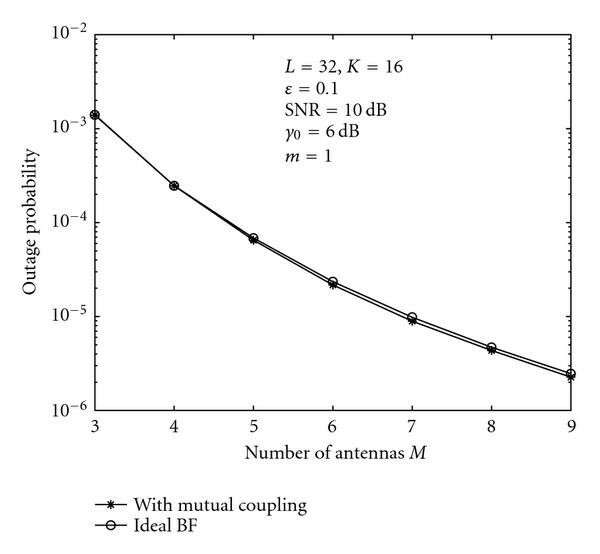 Figure 9 illustrates the impact of the mutual coupling among antenna elements on the outage probability. From Figure 9, only a very small change of the outage probability is observed when the mutual coupling exists in the system. This is because the distance between adjacent antenna elements is which is large enough to eliminate any noticeable coupling. The outage probability of reverse link MC-CDMA systems with beamforming in the presence of CFO over Nakagami fading channels is evaluated in this paper. A simplified beamforming model is utilized to reduce the complexity of the analysis. A closed-form expression of the outage probability is obtained to examine the effect of CFO and beamforming. First, the outage probability is evaluated when perfect beamforming is assumed. It can be concluded that the outage probability improves significantly as the number of antenna elements increases; second, the outage probability is investigated when different types of beamforming impairments are present in the system. It is seen that small DOA estimation errors and angle spreads have only a slight impact on the outage probability of the system; however, as those impairments become large, the outage probability deteriorates significantly. Also it is observed that the outage probability changes very slightly when there is mutual coupling in the antenna array. This work has been supported in part by NSF through Grants CNS-0452235 and CNS-0435297.